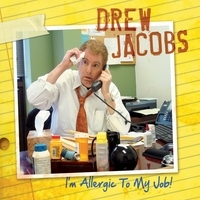 "I'm Allergic To My Job" is Drew's first new CD in 4 years. The title track won 1st Prize in the 2010 USA Songwriters Competitions Comedy/Novelty Category. Drew also covered a Phil Ochs song "Outside Of A Small Circle Of Friends", which features Lincoln Mayorga, Phil's original piano player, as well as a newly written verse by Drew. Additionally "Allergic" includes studio versions of crowd-pleasers "Multi-tasking", "Wives For Dummies", and "There's A Problem In Your Pants". The CD's closer, "Rudolph's On Steroids" is a blues version of the holiday hit, featuring nationally recognized slide player Phil Drum. Drew's first CD "Easy Listening For The Hard of Hearing" includes tracks heard nationally on Sirius/XM Radio's "Laugh USA", The Nationally Syndicated "Dr. Demento Show" as well as radio stations across the country.